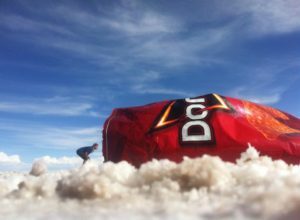 “A British backpacker in Bolivia was today involved in an altercation with a Dinosaur, several Japanese tourists and some giant Doritos in a world of salt”. That doesn’t sound like you’re normal day does it? Well, it wasn’t your normal day and the photos are really the main focus of this article that certainly prove that. The Salt Flats in Bolivia are endless white molecules of salt outstretched ahead of you as you look out into the depths to the mountains fading in the distance like an old Cezanne painting. And with it’s mystic and bright appearance of sheer white which glows ever more so with the reflection from the sun, you have to sit there in awe and amazement. Giving the flats are so large and vast, this is what makes it even more spectacular. As I arrived, I questioned myself if this could possibly be of what the end of the world would look like. I felt like I was in the movie ‘Inception’, a realm that didn’t exist but anything could happen. Have you ever dreamt like you were running into empty space, searching for something? 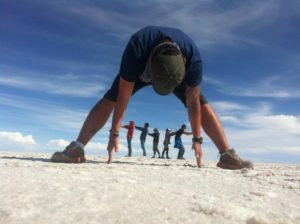 You may have been dreaming about the salt flats at Uyuni all this time. I had been packed in with five Japanese tourists into a 4X4 as our local Bolivian tour guide took us around for the day. He even let me drive for a bit, no handed! The Japanese constantly took selfies and did their trademark two finger salut in all of their photos. 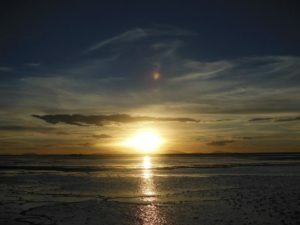 The day seemed long as I walking around the salt flats they seem to have no end. It really was a phenomenal place, it seemed so unique. The guidebooks won’t show you this (although travellers Facebook’s will) but the floors are so flat and steady that with the right camera angle work you can create images that seem real. I ended up sitting on a can of Pringles, peering into a pack of Doritos, and then punching a dinosaur! It makes the most random of photo compilation! The dry heat was relentless but contrasting to what you stood on. As the salt melted throughout the day, mirrored pools of water were formed, almost like an optic illusion or a watery mirage. And when the sunsets, oh man, that was a sight worth seeing. It disappears with no trace. There is no heat nor shadows, the world stands still and there is nothing in the way. You are essentially nothing in a place where you can create anything. How cool is that? 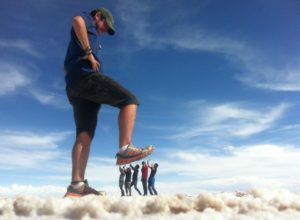 Uyuni is 12 hours from La Paz in Bolivia by bus which will cost around 250 bolivarnos or $36.50 (USD). 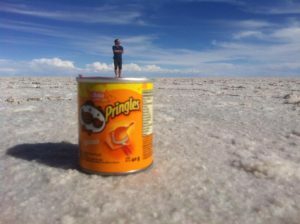 In Uyuni itself, despite it being a fairly small place, you’ll no doubt find accommodation to stay. Hostels, guesthouses and hotels are all available. The town is based on the tourism of the salt flats and the train cemetary. 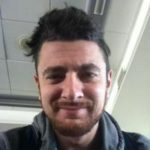 There are tour agents everywhere here so rock up and see how your schedule fits. 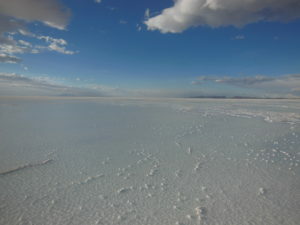 Salar De Uyuni is the world’s largest salt flats at over 10,000km at an elevation of around 3.6m. Its formation was due to the transformation of several giant prehistoric lakes tens of thousands of years ago. 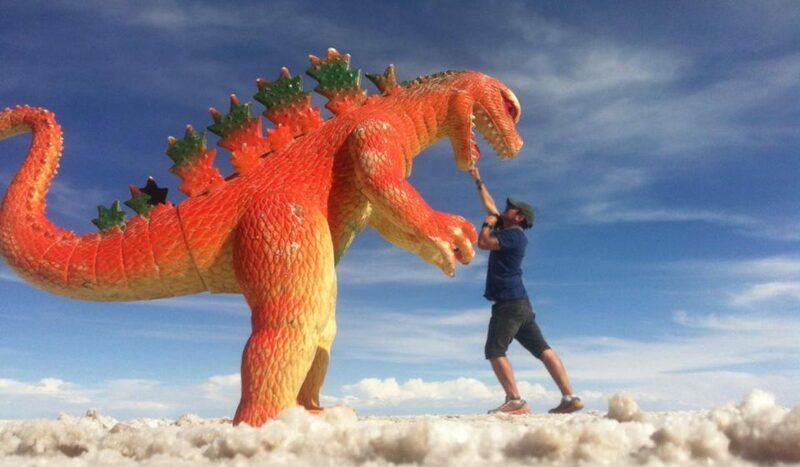 If you are in Bolivia, you have to check these incredible scenes out. One day, mining may just get in the way of what is preserved here today. Like everything, change is inevitable. Head there, let go and have a bit of fun.